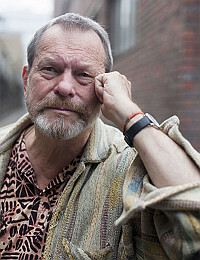 Terry Gilliam got his start being the most beloved guy in his high school and then he went on to do every job that anyone has ever fantasised about and to collaborate with everyone that anyone has ever wanted to meet or be. He worked for Harvey Kurtzman on Harvey's longest-running post-Mad attempt at magazining. He was in Monty Python and did all those animations and distinctive visuals. Then he went on to make really big, great, depressing movies like Time Bandits, Brazil, 12 Monkeys, The Fisher King, and Fear and Loathing in Las Vegas. Also George Harrison, aka the best Beatle, was his number-one fan. Gilliam is a genius. I think that so many things have come easily to him that he has to make the most difficult-to-film movies possible just to keep from getting bored. You have moved through the creative industries like a shark. I envy that a lot, for an artist in one lifetime to work and move through so many different fields and become masterful in them. What I really wanted to be was a film director. That was the goal, but I had no idea how you got there. I grew up in the San Fernando Valley, and it was there dangling just over the hills. From the summer camps I worked at, I knew all of these Hollywood kids - Danny Kaye's daughter, Hedy Lamarr's son, Burt Lancaster's daughters. I was a counselor at the camp while I was working my way through college. Hollywood was so close, but I just couldn't see how you worked up through a system like that. Still, you 're so lucky to have not had to do a "real" job all your life. The last proper job I had was on the assembly line at the Chevrolet plant in Sacramento Valley on the night shift when I was working my way through college. I just hated it. The repetitive nature of it, the stupid dumb mechanical nature of the eight hours I had to spend there every day. At the same time, I could look down the line and see that the other guys were quite happy putting their eight hours in. They got their pay and went home to their wives and families and that's what they were happy to do. And then it also made me crazy working in an advertising agency; I felt like I was trapped in a bureaucracy. That kind of stuff is what led to Brazil, which was the catharsis against all of the jobs and situations I had found myself in and was angry about. The rest of the time I was just enjoying what I was doing, playing and cartooning. I could actually draw things and make these worlds. I think that was the difference. With a pen and a piece of paper I've got control of the world, in a sense. I think that's why a lot of writers get on. They may be solitary figures but they're not unhappy figures. Just give them a piece of paper and they start putting the words down. That's how you get through the mess that life is. Would you say that you get bored easily? I can get bored quite easily but then I get to doing something because I can't stand it. I occupy myself instead of going into a depression. You just channel your positive energy? Yeah, though it gets harder as you get older because it's easier to get bored. Things are less surprising. But, being visually excitable, I can sit and look at something and be amazed at, like, a wood carving over here or the shade on this lamp. Taking in the world around me and enjoying it on a visual level gets me through a lot of the boring moments of life. Do you get depressed, though? I get depressed a lot. I spend a lot of time being depressed. Rather than fighting it, I just go with it. I let the depression take me down to the bottom of the pit. When there's no lower to go, then suddenly you start crawling back up. And when you're by yourself and deprived of stimulus it's just you and your thoughts. But actually that's one thing that I'm fighting for so much now. Because of Facebook and Twitter and all this crap, people don't have time to be alone and confront themselves and who they really are. It's the thing that really worries me the most about the modern world. People just seem to be extensions of a social order now. We have a house in Italy with no telephone or television. My son would be there, and he was used to playing his video games and blah, blah, blah, and he 'd go there and get bored. My wife would say, "Well, we have to do something to keep him entertained," and I'd say, "No, let him get bored and you'll see what happens." After about two days of boredom and saying, "There's f**k all to do here," he started inventing things. He was creating a really interesting world, because he was involved in creating it. He wasn't just having it created for him. I think so much of what we do is now done for us. It's digested, it's handed to you. I like video games but I also think they 're dangerous because of how much time and energy they consume. It's not the same as reading a book. I've heard that there were serious production difficulties on Brazil and Baron Munchausen. Filmmaking is really hard. I've had more books written and documentaries made about my difficulties than other people have, so everyone thinks I've had it worse. I haven't, though - I'm just more public and I like the idea of bursting the bubble about the joy of filmmaking. With Brazil, 12 weeks into the shoot I realized it was going to be a five-hour movie and we 'd be millions and millions over budget. So I stopped shooting for two weeks and tore pages out of the script. I finished the film and then Universal decided it was unreleasable. Luckily I didn't have a Hollywood agent to calm me down, so I went to war and - surprise, surprise - the film was released. Nobody had ever done anything like what I did: take out a full-page ad in Variety with a little black frame surrounded by empty white with a letter in the middle saying, "Dear MCA President Sidney Sheinberg, when are you going to release my film Brazil? 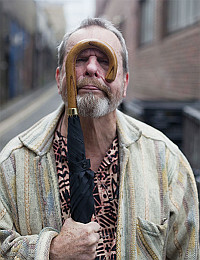 Signed, Terry Gilliam." That's just not done in that town. It created a lot of s**t, but it was good fun. And now you 've got a movie coming out soon called The Imaginarium of Doctor Parnassus. So many people have walked out of screenings of this movie saying things like, "I'm still tripping." By any measure this film shouldn't have been finished at all. This goes back to my argument about altruism and love in the world. Heath Ledger died in the middle of the shoot and so far as I was concerned, there was no way we could carry on without him. But I was surrounded by people who just would not let it go, who said that the film must go on, it must be finished for Heath's and for everybody's sake. So I called up Johnny Depp and he said, "Whatever you need, I'm there." Then we got Jude Law and Colin Farrell. They all came in and took over Heath's part. We ended up with three other actors to finish the part that Heath began. I think that says a lot about love and goodness. And about being able to see past failure and keep going and improvising. Yes. I was in my giving-up state when my daughter, who was a producer on the film and my cinematographer, just said, "No, you don't get out of it that easily. Go back to work." And that's the good thing about my films: They always have a magic quality. And that saved the day. I'd just like to thank you for inspiring me as a teenager, and thanks for inspiring me right now. It was good talking about hope and art. I think they go together. That's what the creative thing is about. Keep reinventing the world, keep making it worth living in - if only for yourself and nobody else. Excerpted from Vice magazine, September 2009. Used by permission. For the full, much longer interview, visit VICE.